With the Maid Cafe. And with my maid. You will fall in love too. 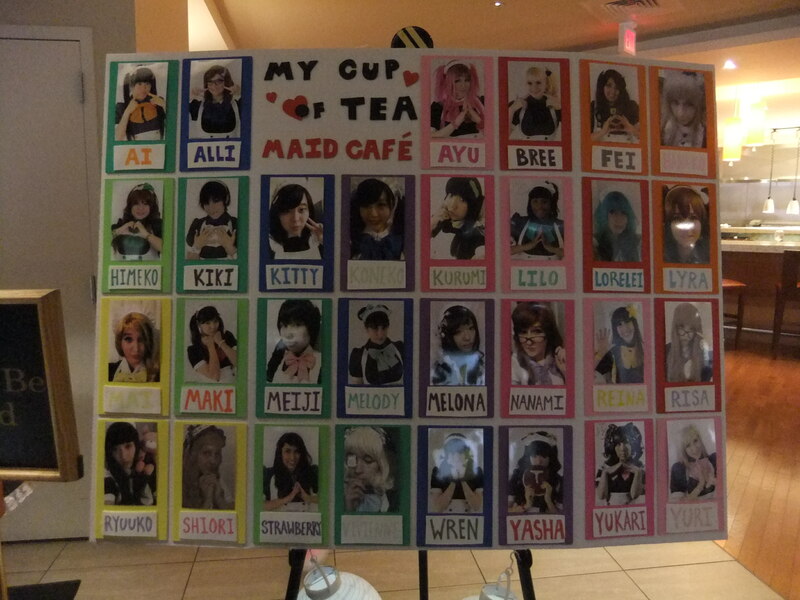 My Cup of Tea was the ichiban event I looked forward to at Anime USA since my magical visit last year. Like last time, I declined to choose my maid. There’s something about picking a person like a chattel that disagrees with me. It’s ironic really because I am completely enamored of the fantasy of My Cup of Tea. I take advantage of my hour as Master to its fullest. It’s just the one initial hurdle that irks me. With the memory of yesteryear fresh, I was disappointed that my maid did not offer to take my bag. Can you tell I was spoiled? Then I realized that Shiori is love personified. For those who are unaware, I don’t live for music. I breathe it. And violin was the one instrument I played before I realized I had the talent of a brick*. It took every atom of my willpower not to leap over the table and crush her in a hug. I didn’t even get to fall in love. I drowned instantly. Watch the video at your own peril. The love continued. Shiori made her way around the cafe, proffering her lovely services and seducing everyone at each table that she stopped at. While I can imagine the courage it takes to do that, I do not want to. She wasn’t familiar with the “Moonlight Sonata” that I requested and inquired how it goes. I could only offer that it was three beats to a measure. Did you see what she did there? Reminds me of my middle school violin teacher who penned “Happy Birthday” on the spot by humming it so that I could play it from the sheet. I must admit some jealousy. I would kill to be able to play something simply by hearing it. Not skipping a note, Shiori immediately improvised with another piece that I regret not recording. Not that I could given that the only muscle capable of moving at the point was the thumping of my stolen heart. The rehearsed turn of her wrist on each stroke and the rich agility of her fingers would’ve fooled anyone except I could sense a slight tremble behind the beautiful smile. Her display of courage only endeared me further. I won’t even bother depicting the sound because to call it love would still be a gross understatement. Upon reflection, part of my reluctance to choose a maid may stem from my wanting to be a kind Master. I don’t want her to be my maid by force. I would rather she serve of her volition. It’s in this vein that I wish maids may dine with patrons should they choose to (or ordered to). I will gladly pay for it. 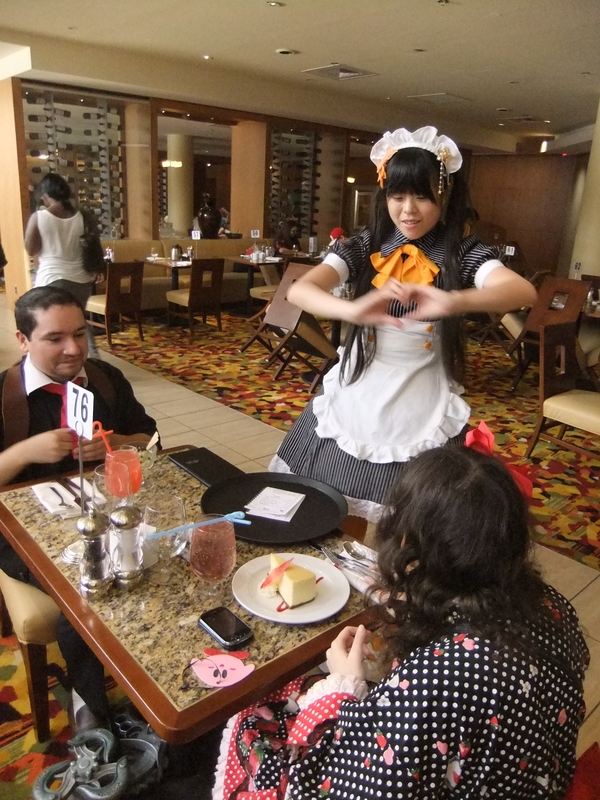 It will also be really, really awesome to have Maid Cafe run all three days. Actually, the same complaint applies from last year. A wall separates the performance place from the vast majority of the cafe which means most patrons are late to notice when dance breaks out. The logistics of the venue make this unlikely to change however. It’s ok. I will just order my maid to inform me of performances beforehand next year! Speaking of which, why isn’t it next year yet???!!! I should’ve ordered her to play on Friday as well! LOL! This is what I’ve been waiting for! Just came back from work, and opened my laptop and saw this article, and alas! “Goushiji-sama,” that’s “Goshujin-sama (my master),” you mean? Maids play instruments to entertain masters. Awesome. That kind of maid service is unheard of. Reminds me of La Corda D’Oro. Or golden corda. 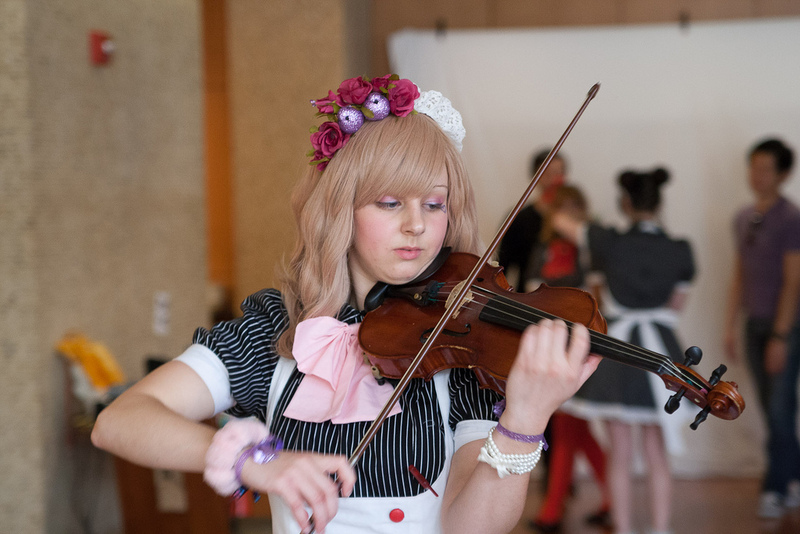 In turn, Shiori plays really awesome violin, very skilled, I wish I could hear improv. Thumping of your stolen heart. And she got large iris, which looks like an anime character. When is My Cup of Tea coming to Southern Cali? If Shiori ever visits here, I would request Ren-ai Circulation, and ClariS Oreimo songs! Finally I was able to read your “Master” piece. And as expected, I was laughing throughout the whole article!